A reader living in the Allen County, Indiana settlement shares a pair of rather surprising photos. As you can see in these shots, local Amish are sending a message to any potential new neighbors. There is a new subdivision going in on a road near us and the Amish that live on that road have been mad that they lost the zoning fight. I thought it was a great illustration of the tension that exists between Amish and ‘English’ in a county like ours. I’m going to linger a moment on the three little dots which finish the message…not exactly ominous, but suggestive. Zoning matters can be fraught with tension for Amish and English neighbors alike. In areas like half-million-population Lancaster County, PA, or the Allen County Amish community–abutting Fort Wayne–city sprawl threatens the tenor of rural life. On the other hand, zoning decisions that allow Amish to operate noisy and sometimes rather large businesses can upset English locals. I don’t think I’ve heard of Amish doing something quite like this before. Though having experience with the Amish in Allen County, I’m not really surprised. “You’re not welcome” is a rather strong inference to draw from that sign; but I’m not saying it might not hold some degree of validity. The Amish are nothing if not traditionalists, and they are also quite human. It is easily appreciated that hundreds of people moving into a new housing development will have an impact on the already settled Amish — just as they would on already settled “English” farmers. Conversely, what about “English” who realize their dream of buying a home in an Amish area, possibly abutting an Amish farm, and then complain about the manure smells and buggies on the road? I agree with the previous commenter; this headline is an inference and categorically unfair to the Amish. I would go so far as to say the Amish “posting” is a better example of good journalism. It’s a statement of fact and not an opinion. I am frankly shocked that a site proclaiming to support and educate would make such an unfair inference regarding a people that are constantly maligned by the general public who, for reasons including fear and ignorance, misrepresent what the Amish are about. I think a retraction and apology is in order. Walter, I disagree with your disagreement. You malign Erik in ways that are totally unfair (IMO). First, it appears that you fail to distinguish between what he reports to be the thoughts of the “reader” and his own conclusions. Here, as countless times in other threads, Erik has taken the high road of making little or no critical comments while still willing to engage those that do. IMO, it is you that have misrepresented Erik here. And if your supposition that misrepresentation is due a retraction and apology…, well, sir, your actions from this point will show just how much you really believe that. So, we know they’re upset (the reader who shared this is not a random reader, but someone I’ve known for awhile whose knowledge I have confidence in). Also, the sign says “home buyers”, not “current residents”. In other words it’s a message to anyone considering moving into the area, not a message of concern for current residents to be careful of stray clods of manure or a “we’re sorry for the odor folks” thoughtful note to the neighborhood. It may be intended to deter home buyers, or it may be intended to hamper home sales and harm the developer. A third, less aggressive possibility might be, the Amish are concerned that new residents in the area will find they dislike the nature of rural living due to smells and road apples, know about headaches other Amish have experienced in that department, and are anticipating complaints and trying to cover themselves (“we tried to warn you”). Whichever it is, the Amish here are not excited about their new neighbors coming into the area. There wouldn’t have been a zoning fight to begin with if that weren’t true. It doesn’t mean they will be pointedly mean or “out to get” their new neighbors whenever they do arrive. Although out of the thousands of Amish I’ve met in various communities, I would describe the Amish in Allen County as among the least warm and friendly to outsiders. That’s not to gratuitously besmirch them or to say there aren’t any friendly people there. And I’m admittedly generalizing about the character of the settlement towards outsiders (though others have written similarly of Swiss Amish communities like this one, such as in Plain Diversity by Nolt/Meyers). My point is that some Amish are just more naturally insular and I’d put Allen County in that column. And in the long run that may have a positive effect on their survival as a community. Some would say being too warm and friendly and intertwined with the English can lead down roads that are hard to reverse course from. If anything this helps support the interpretation in this post’s headline. The dozens of new homes and additional traffic and potential future complaints are not being greeted with open arms. Very well said, Erik. It’s interesting to me that non-Amish people also notice the Swiss Amish personality as being somewhat different (in general) from the PA Dutch Amish. By the way, I’m still having difficulty clicking on new comments. I’m having some issues, too, Erik. Clicking on the link in an email notice often just takes me to the top or bottom of the page, not the linked comment. And sometimes clicking to make a comment to a post will bring me to a new message with the general data filled in, and sometimes the fields are all blank. This is just me, but I liked it better when I could right click on the Make a Comment link, so I could open that up in a new window. I often need to ref. to the specifics of a post when making a reply. But I may be the only one that does that, and it’s not worth altering for just me. Don thanks for your mentioning that. It’s always helpful to know if there are any quirks going on, since experiences can vary by machine and browser (I try to test things in the major browsers, but there are so many versions of those and also local machine differences can come into play). I can’t always promise to fix everything, but it’s still good to know in case something can be done. On the comments, I actually wasn’t even aware that you were able to right-click and open the reply box in a new window. I’m assuming you mean the “Reply to comment” link? Anyway, I just tried it and you are right you can’t do that. Do you remember when that changed? As for it sometimes having the boxes pre-populated (I think you mean things like name and email?) and sometimes not, I think that may have more to do with the browser you are using and its cache. 1. My going-directly-to-comment-from-email-notice seems to be working better now with the cache change. 2. Pre-populuated fields have been a hit or miss thing, even through the morning. I wonder if it might have come caching-related cross over. But it worked okay this time. I’m sorry about that Mark and Don (and anyone else that’s had trouble with it), and I’m glad you let me know. I changed a setting yesterday when Mark alerted me to this, but looks like I need to dig back in and try to figure it out. As I mentioned on Mark’s original comment about this, we are using a new caching plugin (as of about a week or so now) which essentially makes browsing the site faster by saving and serving copies of each page, rather than having to generate a given page each time a link is clicked on, which takes more time and server resources. This is good for readers because it should make browsing faster and pages appear faster when you click on them. The issue is that when pages are altered or new comments are published, the page needs to be re-generated to reflect that. I enabled a setting on comments pages that I thought would do that, but it either isn’t working or needs another setting enabled or something else. This may sound like more trouble than it’s worth, but having the caching enabled should definitely be worth it given the number of visitors here. But comments definitely need to work as they should as well, so let me look further into it. Also, if you notice the problem occurring, refreshing your browser cache *might* be a short-term fix until I can figure this out. Again, appreciate you letting me know as sometimes different users have different experiences based on the machine they are using as well. But I think this is a more general issue that I need to tweak. Well, that may be more than you wanted to know, but I thought I’d explain in a bit more detail. I sometimes hear complaints here in our Amish community about the horse manure on the roads, etc. And I wonder, did they not know that would be a part of life when they chose to build that nice country home right in the middle of an Amish community? Good point, and I think that’s not too uncommon, is it? Those people probably had previously only known the country side from vacations and brief visits, or if they’d live in the country before, it was in an area without horses and/or much animal farming. If they had ever lived for awhile in an area with Amish, I doubt they’d complain. It just chaps my hide when people complain about “Buggies on the road” I would rather deal with “Road Apples” and “Buggies on the road” and Farm odors any time; Verses dealing with the daily grind and stress of having to continually drive defensivly (drivers here are awful) on extremely congested roads and the interstate in Seattle (and surround areas) of Washington state!! And don’t even get me started about “Residencial Housing developments!!!! I totally support how the Amish are possibily feeling about have a housing development being built in their area!! I deal with property development all the time, especially new sub-division construction. The land that the new development is proposed and approved for was or is farmland. The people (developer) who bought it paid market price for the land. Why didn’t the Amish buy the land, over bid the developer? Then this would not be an issue. Even after the developer bought it he would sell it (yes for a profit) to the Amish. The goal of developers is to naturally make money. Mark my words, once the new sub is built out, those residents will cherish the fact that there is so much rural land surrounding them. Then, when the adjacent land is rezoned for another new sub the residents in this sub will come unglued like the Amish are with them! I see this all the time. No one likes change. The only way for the Amish to deal with this issue is to either buy all the land around them or get into politics and use the legal system to control the outcome (which isn’t going to happen). Derek that is an interesting question. I don’t know why someone Amish did not purchase the land (assuming its availability for sale was known to potential Amish buyers before the developer acquired the property), Allen County is a visually well-off settlement, though land prices being in a desirable area so close to Fort Wayne I expect are very high. I used to work for a semi-rural municipality that had predominantly been a farming community experiencing a population growth with several new developments. What was so amazing was those moving from urban areas who proclaimed to want to live in the country would call the municpal office and complain about it being too dark, where are the street lights? We want sidewalks, whats that horrible smell, etc. etc. They seemed committed to urbanizing the area. I think that the Amish sign was very wise. The new neighbors could not say they had not been warned! Amen and Amen, Amy. We built in northern Lancaster County in a horse and buggy area. I can’t tell you how many times I have heard people in the market or post office complain about being stuck behind the horses or the manure on the road. I have seen people harrass a child driving a pony cart and a car pass too close, and when the horse shies, the next car honking because she had to wait before passing, then passing and hoking loud and long. The poor child (maybe 10 or 12) could not control the horse and it ran off into the field. We moved there because we wanted to be there and we knew what we were getting into. My answer to the people who come and want to citify the area is “go back where you came from”. I think the Amish people are just telling the (probably city people) what they are going to be living next to. So few Americans grow up around farms anymore, they have no concept. If the warning is understood, this sign can avoid future unintended problems.Maybe it should give a little more information? For the people bent on enforcing their will it won’t help. One other funny thing to note about this manure hauling warning–it also struck me because there are hardly any full-time dairy farmers anymore in the Allen County Amish community. They dwindled and basically disappeared, I believe they were mostly gone by the mid-1990s. Nolt and Meyers in Plain Diversity explain that this community stuck with hand-milking until 1992. Basically the technological restrictions made it too hard to make a living in dairy farming in this settlement. Many of the local Amish are involved in the construction business, I’d say that’s the dominant industry there. There aren’t a lot of Amish shops like furniture makers that you see in other Amish places in this community. I remember one or two calf-raising businesses, and a couple other quirky ones (a race horse trainer), but I wouldn’t call this a dairy farming community at all (maybe there are other animal farms like hogs that have come in, but don’t remember seeing much of that in my time there). My most extensive visit was 2006, but have been back a couple times since. There may very well be one of the few dairy farms in the area of this sign. In any case, I thought it might be worth mentioning that this is one of those Amish communities where the traditional dairy has basically given way to other occupations. I suppose the call is ~littered~ with subjectivity, but I’d take chicken over hog any day of the week (but would avoid both if at all possible). But then, the area I was raised in had lot of chicken farms, and many of the neighboring farms would spread the litter for fertilize. Maybe I got (ever-so-slightly) desensitized by all that. If you want to upchuck your breakfast, drive to Behalt on a day when the wind is coming from the Northeast. Ask Mark about it if you don’t understand! 🙂 Occasionally it even drifts clear down here to New Bedford. Those poor folks that live next to it are hardy souls, well, at least longsuffering with a stench that about turns my guts. Unfortunately, I think I know what you’re talking about. The rendering plant, right? I remember in 2005 when I was in that general area. I can still recall being at one farmhouse and the Amishman I was talking to cast his woeful eyes in that direction and muttered something about the place. I could tell it was a burden long-suffered. I would absolutely have to move. My nose is too sensitive, I smell things other people don’t, unfortunately. You are right, rendering plants are the worst of the worst. I have asked people why they dont get a petition to get them to try to control the odor (rumor is that the company has “connections” with county officials, but I suspect that may be raw rumor). It comes down to like the Amish manure hauling … who was here first? I can hardly imagine someone buying a house within a couple of miles of the place, only to wake up one morning to find out that they live close to a place that spews out an odor something approximating vomit and manure mixed together. And when the wind turns just right it comes in the windows … even if they are closed. By the way, I had some problems with clicking on comment emails last week but this one functioned as it should. That would be a nightmare. I read in a Columbus Dispatch article that there were only two rendering plants in the state as of 2010, this being one of them. Bad luck to have it in your backyard. Thanks for the note on comment emails. The rumor that there are “connections” that allow the local authorities to overlook the health issues has been going as long as I can remember and I have no idea if it’s true or not. I suppose people that smell it regularly get somewhat immune to it, like someone with sulfur water. I’ve never heard of a rendering plant. What exactly is it? I know what it means to render down a hog for lard — is it anything like that? I went to college in a paper mill town, and while most of us outsiders complained about the nasty smell, those that worked there told us that it just smelled like money to them. (ha). I believe they are making fertilizer, bone meal, blood meal, etc. Truck loads of dead-stock or dead animals are trucked in and processed, but just what happens I’m not sure. The smell does smell a bit “meaty” but not in a way that makes you hungry. I think the sign is appropriate….to live in any charming setting always has its “down-side,” and it is only wise to have all the facts BEFORE moving into the area. Around here (Colorado Springs) people move next to the Air Force Academy (a very desirable area), and then complain about the noise from the numerous aircraft to the point of trying to force their need for quiet on the Academy! To me, that is just nuts! 1) When the proper procedures have been followed and a decision has been made, it is up to us to abide by the decision, regardless of what our position had been. We need to move on and accept the decision as though it had been our decision. 2) Like the Amish, I also attempt to follow the doctrine of non-resistance as taught by Jesus. In my opinion, this sign can be seen as not really following the principle of non-resistance. In our province, this situation would not easily have happened. We have regulations which specify minimum distance separation for housing developments from livestock facilities. I wanted to build on a half acre lot that I had owned for many years but had to go to the local township for a minor variance permit because it was too close to the neighbor’s dairy barn. 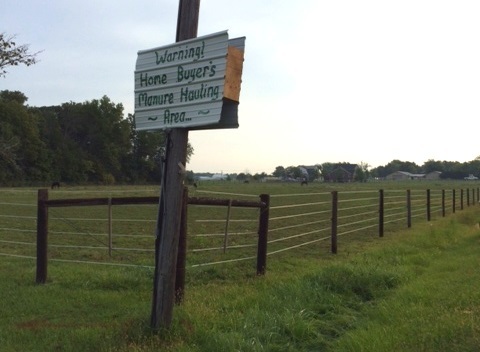 Just to give the Amish the benefit of the doubt, we can also view the sign as a friendly warning to prospective home buyers so they are not caught unawares. The problem her is not unique to the Amish, 20 or so years ago we had some friends who farmed in a rural area and among other farming they raised pigs (at any time they probably had 50 sows) their family had been growing pigs on that farm for at least 50 years. For all I know, the sign has been put up as a genuine warning for future residents so they don’t start complaining when the smells of the country come drifting by! The property developer should have no worries about the sign and will sell all the homes no problem – provided the homes are well designed, well built and fit for purpose. I must say, wouldn’t it be great if there were some Amish property developers – I’d certainly buy a home built by them! Here in the UK, there are often complaints from city folk moving to quiet villages asking for the Sunday morning church bells to be stopped or for existing residents to stop their cockerels calling at day break. I can pretty much guarantee that the home buyers will not see that sign. And if they do they will laugh and buy a home anyway. Then they will ban together to change zoning and add sidewalks, etc until they force the Amish or any farmer out. As for out bidding the developer, they couldn’t afford it. As for buying from developer, not a chance. That developer will make millions on selling the houses; much more than the Amish could afford, or anyone else for that matter. Just like here in Florida, developers are pushing out average people. Kudos to that person for trying but it probably is futile. Debbie it did seem to me unlikely that one could buy from the developer once it was in the developer’s hands. A couple of online sources I came across had land at $10-12,000/acre in the Grabill area; one was from 2001, the other from 2012. I’m not sure if I would take this sign as “You are not welcome here.” If I was a farmer with a housing development going in beside me, I’d be worried about future clashes. We’ve seen it happen, and not just for Amish farmers either. If I was looking to build a nice new home in a suburb or housing development I might be unhappy to discover there is going to be manure spreading next door and think twice. Not far from us is a large-scale non-Amish farmer who spreads pit manure on his fields. It can get really stinky when he does that, but it’s not the kind of thing he does often. We just shut our windows towards the wind and bring the wash in then go about our lives knowing it will soon fade. One of our non-Amish neighbors, who has built a very nice home in this “country setting” gets VERY upset about it, ignoring the fact this IS farmland and the farm was here first. Maybe such a posted sign could have avoided this tension? I’ve tried to pass it off with saying “It’s just fresh country farm air,” but he’s not in the mood to shrug it off, but adds it to a list of things that bug him, such as manure on the road, the air-compressor at a neighboring work-shop, and so on. But before I make him sound like nothing but a grouch, he is a great neighbor in other ways and we overlook some of the things he does that could be considered annoying. Living in a community, any community, involves some give-and-take, not? The three dots suggestive? I thought three dots (I was thinking of them as periods and seem to recall that that’s called an “ellipsis”) don’t seem suggestive or threatening to me, but maybe I’m wrong in thinking it shows a sentence that is not totally complete. Mark, you make some good observations. And if I may add one to that…. (Oops, elipses. (ha)) A couple of weeks ago as I was visiting with an Amish man he made the comment that went something like this: “While most of us do speak English, the truth is, we think in German. And sometimes the translating from German to English ‘on-the-fly’ comes out rough, not always meaning exactly what we’re thinking.” I wonder if this sign might be an example of that — something that might too easily be understood to say something that was never in the sign-painter’s intentions. Don, I’m trying to figure out if your ellipses were intended as ominous or just suggestive. Assuming they are harmless, (ha ha — could not resist the chance to get ellipses and assuming into one response :)) I’ll sail on ahead. Very good point about thinking in one language and translating on the fly. Anyone who lives in a mixed area like ours could likely tell lots of stories about misunderstandings through language and what is “understood” or misunderstood. I very much sympathize with their situation. They have completely lost their Christian witness. The most obvious scriptural response would be to deny the flesh, practice the best possible manure management, and be a shining example to the new neighbors. The sign implies to me that the Amish have been in similar situations many times. They are farming for years, new housing is built on land surrounding their farms and the complaints (and lawsuits) begin. I do not find the sign offensive but maybe a bit blunt. Although there is a more famous (infamous?) explanation of the term “assume,” I prefer the less-known one that says that an assumption typically says more about the person making it than it does about the situation/person he is making the assumption about. If the “reader” in this article *knows* first hand the attitude and implications that motivated the sign painter, then that is one thing. If it’s an assumption generally based upon the disagreements…, well, then it’s nothing more than an assumption. Since the sign can be equally understood with either ill or non-ill intents, I think it best to not make any assumptions — for if I do, it will speak more about my heart than the one of the sign-painter. Point well taken about assumptions, Don. I’m glad you made it. I have definitely assumed something, but sometimes bloggers have to make assumptions, and given what we know I think it’s a reasonable one 🙂 I think in a vacuum it could be equally understood as having ill or non-ill intent, but with the additional info we have here from the reader, and considering a couple of points mentioned in the above comment, I don’t really feel out on a limb in my assumption. Erik, I think your original article was fine. Myself, I wouldn’t label anything that was your own input on it an assumption. As to whether the original ‘reader’ was making a legitimate conclusion or an assumption — I’m in no place to be able to make a call on that, and as such I prefer to make assumptions in either direction. But on the other hand, the judgment you’ve show in the past makes me think you have given due diligence in determining that this is a credible source, with likely creditable perspective. My assertion was written after reading several comments that seemed to “break-and-run” with (what seemed to me) assumptions of the motivations and heart of the sign-painter and home owners by those of us that are further removed. But nothing at all meant to even remotely question your thoughts or conclusions. I can see how it could have sounded that way, and my apologies for not being clear on that point. …should have been “as such I prefer to NOT make assumptions.” Sorry. No worries Don, I understand what you’re saying. I think that since no one was in the head of the sign-maker but he, I am bridging a gap here. I don’t really mind measured assumptions based on a variety of available information if the (assumpter? assumer? assumptionist? conclusionist? 🙂 ) is prepared to reconsider on new information (and I’ll be glad to do so in that case). Having read the comments this is generating makes me want to clarify my original point–I was not debating the relative merits of subdivisions in farm country, etc. I was merely pointing out what I believe is poor reporting. That said, we might do well to talk about tolerance… an increasingly scarce quality in our society. All generalities are false, certainly, but I opine that the Amish are in fact a very tolerant group. We misrepresent them… we malign them… we make them a tourist attraction and descend upon them without regard to their privacy and rights to individual choice. Must I go on? One Amish guy might be a little fed up–they are, after all human–so he posts a fact. The sign could have said “school zone” or “hospital zone.” What does that infer? Will somebody complain because it means at certain times of the day we have to drive a little slower? Does “hospital zone” imply that healthy people aren’t welcomed? Would this sign be news if posted by a non-Amish Farmer? The Amish tolerate our vehicles spewing noxious fumes; what’s so bad about a little horse poop? I occasionally joke (except it’s not really funny) that the one thing I can’t tolerate is intolerance. We think the Amish live among us and I think they are pretty good at it. But we also need to understand that we live among them. I think we could get a lot better at it. Walter, you have made very good points about tolerance & intolerance. In any mixed community there has to be mutual respect & tolerance. I can think of Amish & English people who are very good examples of this as well as Amish & English people who have a lot to learn on the subject. We are all human, right? For Leon… in conversation, I usually say, “All generalities are false. Including that one.” Another bit of interesting reasoning goes along with these two statements. 1. The following statement is true. 2. The preceding statement is false. Contrary to at least one comment there was never any personal intent to my original post and I’m quite willing to admit my bias is that the Amish are more often the victims than the perpetrators. I still maintain that this sign does not say “You’re not welcome” and that makes the title of the original post/article misleading. “Amish to Future Neighbors: Manure Warning” would have been more accurate. One of the perhaps amusing thoughts I had concerning this sign is reflected in my use of the word “post” in reference to the sign. This Amish Farmer doesn’t have a Facebook page, so he posts on a pole. Much like Facebook his “post” generates a wide variety of comments. It might be amusing to speculate what signs might appear under his if others hung them. Discussion and disagreement can be productive if it is not disagreeable. Another bias I claim is the belief that as a society we are becoming less and less able to distinguish fact from opinion. In a tolerant society we would solve problems instead of assigning blame. Being that “one comment” writer, let me clarify that I did not mean to suggest that your comment was intended as personal. But it was misrepresenting (IMO) of a person. And whether you live by your own standards in how you respond to that person — like I said, your actions speak to whether or not you live by what you expect of others — personal, or not. Walter I am glad you posted. Your comments are welcome here. You are obviously very thoughtful about the issue and the Amish in general and you make some good points. Your alternative title would have technically been more accurate (in a vacuum, it is simply a manure warning sign) but I think would have buried the point of what’s going on, which is that there was a zoning battle and the Amish side lost. I think this was a good opportunity to bring up the idea that various zoning and construction issues arise in quite a few rural areas where Amish live (right now there is a conflict in Minnesota over refusal to install a septic system in a very traditional Amish home). Sometimes Amish and their allies “lose”, sometimes they “win”. To me it is striking when the Amish as a people apart do take part to whatever degree in public battles over issues that concern them. I don’t say that to criticize anyone Amish, I just view it as human. It may not be holding true to separation from the world in the purest sense of the concept, but I certainly sympathize with them. Erik: Thanks for the above comments on viewing comments via refreshing browsers, etc. I appreciate what you are doing by operating this website, very interesting and informative, sometimes amusing also! So the person who posted that sign was raising a bar to future litigation in some degree, by creating an “affirmative defense” in case any developer or land owner in the future should seek to sue the farmers for their general and usual farming practices, they can say “we told you so”! Very wise of them, probably without even knowing the legal consequences of their prescient action! I don’t see any hatred or animosity in the wording at all, and actually it could be construed as an act of love to forewarn future residential landowners. Thanks Leon, interesting insight from you as always. And I like your interpretation. If this is only about protecting themselves, I wonder if they were consciously doing that with potential future legal pitfalls in mind. Maybe they are more litigation-minded than your average Amish person or have the benefit of someone with a legal background advising them. Thanks for this response… I will admit that I’m a bit touchy and quick to defend the Amish. Additional details have come up in the comments and discussion which might make the headline more acceptable, but I also think it’s important to consider many people do not read past headlines and the first few sentences. In a sense I’m having fun with this, but in another sense I am not. The more certain we are of our opinions, the more likely it becomes we’d benefit from at least considering what else might be true. Your comment in your post immediate above resonated strongly with me. You admitted to be “a bit touchy and quick to defend” the Amish. I think we are much alike there — and I trust that that has come across even in my “assumptions” post earlier. I am quick to defend (when I feel there is a wrong) because they are real people — a number of them my personal acquaintances and friends — and I try to take up for unfairness toward those I care about (and others as well). (I’m sure we agree on this.) And feeling that way toward my Amish friends who are at times not given a fair shake, I trust you can see how I feel and respond in the same way toward those in a similar situation who are not Amish as well — case in point, Erik. Right or wrong, I felt that he was unjustly misrepresented. And if you can identify with the feelings that generates within when it is an Amish friend on the block, then I hope you can at least understand where I was coming from with this my not-Amish friend. I can’t let the Amish / not-Amish distinction make me treat one differently than the other — both are human, and both are friends. If I’ve been or it’s come across as a “bit [too] touchy” on my part, I hope you will forgive me. As a man that similarly stands up for those he cares about, I trust you can understand the heart behind the actions. You’re certainly right that a lot of us just skim headlines. I hope this one compelled people to read a bit further and past the article into the comments as well. Sometimes it’s difficult to put the Amish into sound bites because there’s often a lot of nuance to whatever issue you’re talking about, whether it applies to all Amish or just these over here, and so on. I’m not nearly as good a writer as some I know, but hopefully posts like this end up being more engaging than shocking or inflammatory. There’s a new comment from Erik but I cannot access it. Mark, you might try “refreshing” your web-browser. (I use FireFox and there is a little “looping arrow” refresh icon at the top of the page where you type in the URL. I don’t know where it would be on other browsers.) That has helped me with some of the quirkiness here today. If you don’t mind trying Don’s suggestion Mark, sorry again. I’ve also actually just disabled caching on this post (or so I believe), so hopefully that will be a temporary fix for this one today. Right to farm laws anyone? Some towns have so-called right-to-farm laws that explicitly enumerate farmers’ rights to operate their farms free from zoning and other harassment techniques people use to hinder such operations. I know some places vaguely outside of Albany, NY and headed north if I recall correctly that have “__________ is a right-to-farm town” signs posted as one drives into town – at least as of about 15 years ago. It sounds like Amish folk and others in the discussed area might want to check that kind of thing out, though it sounds like it might be possibly too late in this case. That and the fact that many Amish don’t get involved in town voting affairs might make right-to-farm laws a bit difficult to achieve for them. As I read the most recent comments, the thought that comes to mind is “We are more alike than different.” I think that applies whether we are comparing Amish and English or any groups or individuals who may, in fact, have different perspectives. I place a lot of value on lateral thinking–a skill that I fear is diminishing (another one of those generalities) in our society. Anyone who doubts that need only read a few blogs or watch discussions on social media. All of which to get to the point that any discussion that causes one to think has value. But valuable discussions are also a bit of an art form. In addition to applying this to this discussion, we might apply it to the conflict between the Amish and the developer that triggered it. Another of my many biases (not all biases are bad, by the way) is that laws are rarely solutions to problems. Fish or fowl, we are more alike than different. There have been nasty lawsuits, with the Amish losing and having to pay mega-bucks for the suffering the smell caused their innocent neighbors. Other Amish communities were asked to chip in and help come up with the funds. I just finished reading this blog–congrats on your new book, Erik. Are you by any chance looking for a co-editor? I expect Johns Hopkins Press will publish it in 2015. Perhaps you will title it ‘English Housing Developments, Attitudes of Manure Hauling Amish Males in Allen County (IN), and the Hermeneutical Task of Interpreting the Six Words and Two Squiggly Marks that Sparked Unremitting Controversy: Collected Essays’? But don’t forget about those three dots! For a while it seemed this blog was going viral. I thought I would find it at the top of BBC’s world news headlines this morning, right next to something about Daesh trying to mint their own currency. I would say they are equally newsworthy. And I was also hoping it would go viral because someone would then need to write an article for JAPAS explaining, in sociological terms, how this all came about. Something that also surprised me was how many philosophers and linguists suddenly appeared out of thin air in order to challenge or defend one or more of Erik’s statements. I sometimes wonder about the religious characteristics of those that follow this blog. Does everyone fall into the category of being excessively idealistic, and an Evangwlical? Or are there a few Catholics thrown in for good measure? If I would mention that I am a critical realist with regard to the metaphysical status of linguistic signifiers, would this also prompt 61 responses over the next twenty four hours? It has been a long time since I witnessed such controversy. The last time I can recall is when I preached ‘Sinners in the hands of an angry God’ on July 8, 1741 in Enfield, Connecticut. Truth (what the Amish are saying—as long as it IS the truth) is smellier than fiction (what the developer is saying). I belong to a group on FaceBook of ranching and farming wives. I have read several posts from them where they talk about people who have no prior ‘country experience’ moving out tot he country then becoming upset with their neighbors because of animal smells an animal behaviors. Many people move out ot the country and expect it not to be so, well, COUNTRY. While I’m sure some of the sentiment behind the sign might be hard feelings, I’m sure part of it is also the frustrations felt by the Amish and all country folk over city people not understanding country ways and complaining about it to their neihgbors who got there first, and are doing what they have done for years, making their livelihood in a not so clean and rosey manner. The message to city folk is clear, we’re country out here. If you don’t like all aspects of country life, stay in the city. In rural NC, we have the same problem. People who have farmed here for generations are faced with large numbers of newcomers, usually from urban or suburban areas, who move here because of the quiet, slow-paced rural lifestyle. They somehow fail to notice their neighbors dairy farm, pig lot, or the fact that combines on a narrow rural road move Veeerryyy slowly. So then they go to the department of Transportation, county commissioners, or what have you, and try to get rules put in place changing all that. Then they wonder why folks who have lived here don’t much like them…. So the Amish are not the only ones who deal with it. Good point Forest, made by others as well. A lot of it is rural/urban. Amish have the additional concern of vehicle danger as well, since buggies usually lose in road accidents. I live in Fort Wayne, and have been to Grabill several times. We have become friends with an Amish family there. They are very welcoming of “Englishers”. There are several English families living among the Amish there, and they all get along quite well. Seeing this sign, it simply tells me that they are just letting Englishers know that they haul a lot of manure & the smell, especially in warm weather, can be quite offensive. I don’t see it as the Amish telling Englishers to stay away.I also have friends that live among the Amish in Berne, Indiana & they are very friendly with them. That sign was posted by an “English” who lives next to the subdivision site. Not Amish. He obviously likes his country setting and is not happy about having a subdivision in his back yard. He is using the Amish presence to deter home buyers. I live in Grabill. That is really interesting, Janet. 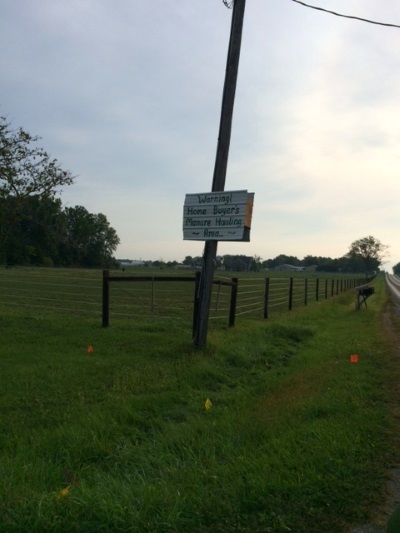 All that speculation about the sign and it turns out to not have been posted by an Amish person. Thanks for sharing that. I agree with Mark, thanks Janet for further info. In either case I was informed that the Amish were not happy that they lost the zoning issue, but going by this they apparently aren’t the only ones. That said, my experience living within a few miles of the Amish and having a builder who was raised Amish, converted to Mennonite before Baptism is that most of the people are among the biggest-hearted that you will find once you get to know them. There is a tension between cultures–but only when considered from the perspective of English culture impacting the younger Amish who haven’t yet entered the Church. Parents do have a fear of their children being lured away into the surrounding English culture. Also, with land values being what they are, the ability of Amish to enter into agriculture is diminishing. Fathers cannot divide up their farms to respectable parcels for family. Many of the working Amish still have farms of varying size, but primarily as their own source of food and sustenance rather than to sell competitively as non-Amish farmers do. Now, it isn’t unusual to see Amish work crews on construction sites or in specialty factories making cabinets and other woodworking jobs. To be honest, many of the Amish in our area also are participating more in modern society than previously. It isn’t unusual to see more than a few shopping at the local Wal-Mart and Meijer stores. More are relying (in a limited way) in technology. I’ve seen cellphones and farm houses with solar panels on the roof. The acceptance of modern technology is slow and cautious. In Grabill, English and Amish alike who know each other will converse and socialize when they run into each other at the hardware and other stores. Schmucker’s Produce is another spot where the Amish and English come into contact. As I said, once you get to know them, they are some of the kindest hearted, down-to-earth people you can get to know. When I worked in the hospital, I came into contact with many Amish when caring for their family members. I worked in neuro rehab, and can tell you that those patients had long term stays. After the initial week or two, that reserve demeanor would drop, and I had many positive and warm experiences with the patients and their families alike.